The consolidated know-how of the Cantieri del Golfo Group finds its maximum expression in this great new open, Maxidrago, a boat that will bear the status of flagship for this line of pleasure craft, produced under the brand Italcraft. In confirmation of this, the obvious lineage of this boat, in particular of its bottom, heir to the military production of the Cantieri del Golfo. The quickwork of Maxidrago, which will also be produced in a "short" 90'version, is in fact based on the bottom on the Corrubia class patrol boats, with 27 of these already produced by this boatyard in Gaeta for the Financial Police. Onto this consolidated base the designers have realised a boat with definite aesthetic impact, which is also able to fully make use of the large amount of room available. The interiors of the first model include a large owner's cabin located amidships, making the most of the whole width of the boat, with a dressing room and a bathroom with tub. Going towards the bow there is first the saloon, integrating a well-equipped galley; then two twin cabins and the VIP cabin, all with their own bathroom. As far as the external spaces are concerned, the best feature is the harmonious design of the cockpit, furnished with sofas and sunbeds, with room for a large number of guests and fitted out to very high qualitative standards that, like the interiors, include the use of fine wood, steel and also Kevlar and carbon, underlining the performance and technological nature of the boat. The stern sundeck looks nice and is also functional, not only long but also much wider than the prospect of the stern, meaning it offers maximum use for all swimming activities. 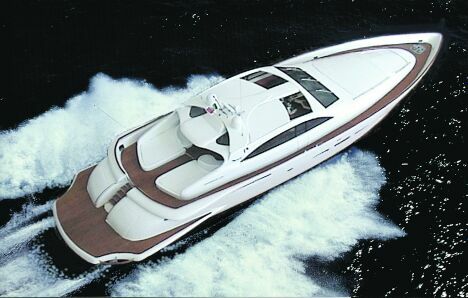 Its performance is expected to be really good, with a maximum speed of about 45 knots and a cruising speed of 40.